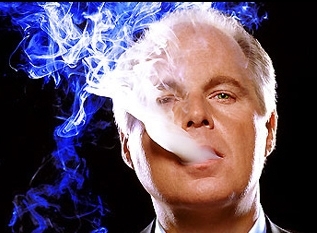 Have you Heard what Rush Limbaugh said about the FDA and electric cigarettes? When someone told me that he mentioned electronic cigarettes on his radio show, and even slammed the FDA, I was anxious to hear the clip, and did a quick search on Google, finding that someone made a video already. In listening to what he says concerning the Ecigs, I don’t disagree with his sentiment about the FDA, or big tobacco, or the pharmaceutical industry, or the state and local sales tax that might be being lost. However, he’s dead wrong about one thing – he’s *not* on the “cutting edge”, and this fight has been a long time coming. When Rush talks about the Volcano electric cigarettes that he smokes, does he not realize that their old three piece technology is dead? 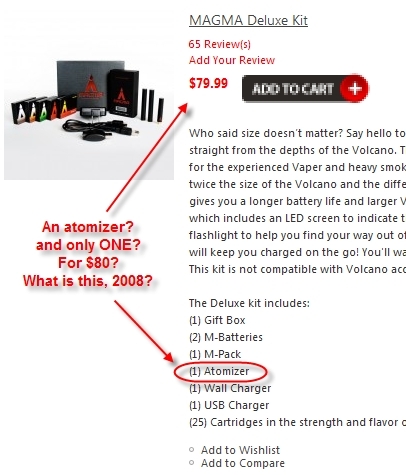 Here, look on their website, where you can see that even in their top pf the line model, it still uses a separate atomizer, a technology that I showed to be dead in May of 2009 ! Far more “cutting edge, superior in every way, would be the newer two piece e-cigs, like those offered from GreenSmokeor this state of the art unit from Esmoke with a charging case.